In a tweet today, pod2g, a member of the evad3rs, the team who brought you the evasi0n jailbreak, stated he was "being more and more confident about an iOS 7 public jailbreak." He also noted "that does not mean soon" in regards to an ETA, so don't expect one anytime soon. 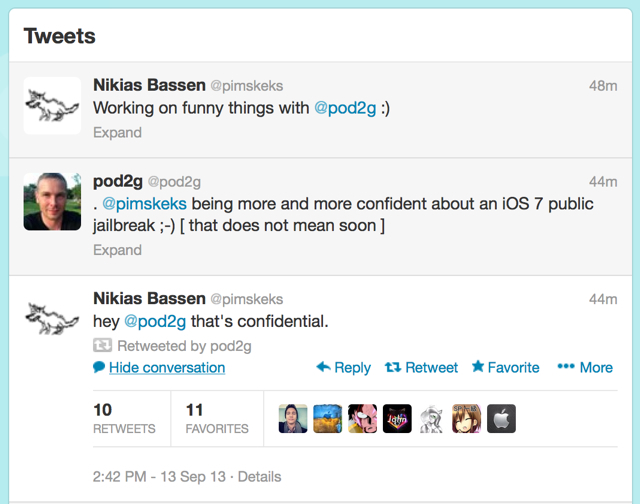 Pod2g was replying to @pimskeks who tweeted that he and pod2g were "working on funny things." In response to pod2g's revelation, pimskeks tweeted, "hey @pod2g that's confidential." A few days ago, the evad3rs noted that they have already achieved unsigned userland code execution on iOS 7, giving them a good platform for poking the kernel.